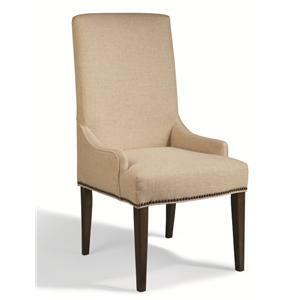 Mark your place as the head of the household with this fine upholstered dining chair. A dark, Ochre wood finish adorning the legs makes this chair a fabulous piece to match with a darker-finished wood dining set. The design is based off of the sleek Parson's chair, and shows this in its tall, tightly upholstered back and subtly tapered wood legs. Half arms and brass-finished nailheads add sophisticated style to this modern design. Only available in sets of two. 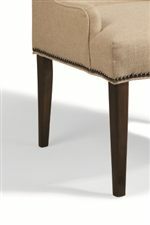 The Rothman Tall Upholstered Chair with Nailhead Studs by Magnussen Home is available in the area from BigFurnitureWebsite.